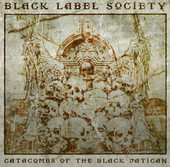 Track Listing for Black Label Society ‘Catacombs Of The Black Vatican revealed on iTunes! Well it appears that the track listing has been unveiled in iTunes. Little by little we are being whipped into a frenzy for this release!!! Viagra for our ears!!! This entry was posted in Artist, Bassists, Classic Metal, Classic Rock, Drummer, Glam, Guitarists, Heavy metal, Internet Radio, Metal, Music, Outlaw Metal, Rock, Rock N' Roll, RockStar, Sleaze, Surrealist, Vocalist, Whiskey Metal, Wornstar Clothing and tagged 80's, Black Label Society, Bleach Bang, Bleach Bangs, Bleach Bangs Radio, BLS, Catacombs Of The Black Vatican, Chad Szeliga, Charlie Owens, Classic Rock, Dario Lorina, Hard Rock, Heavy Metal, John "JD" DeServio, John DeServio, Metal, Music, Randy Norris, Rock, Rock N' Roll, Rock Star, RockStar, the Hellion, the Hellion Rocks, Zakk Wylde. Bookmark the permalink.